I love the look of this dish, it is such a fantastic array of strong colours. Use regular chicken if you don’t like smoked, or flaked cooked salmon, or even sliced raw salmon that you’ve marinated in the juice of two limes for five minutes. Put the lentils in a saucepan and cover with water. Bring to the boil and cook for 15–30 minutes, or until the lentils are tender but not falling apart (the length of time it takes depends on the age of the lentils). Meanwhile, toast the quinoa in a dry frying pan for about two minutes, then put it into a separate saucepan, add boiling water, cover and cook for 15 minutes. Peel the mango and cut off the ‘cheeks’ (the fleshy bits on each side of the central stone). Carefully cut the cheeks into slices about the thickness of a pound coin. It is very difficult to remove the flesh nearer the stone neatly, so just use the cheeks for this dish and use the remaining flesh for something else (or eat it). Drain the lentils, quickly rinse them in hot water, then toss in a serving bowl with the drained quinoa, the mango, watercress, chicken, mint, olive oil, lime juice and seasoning (taste and adjust it if you need to, grains and lentils need assertive seasoning). 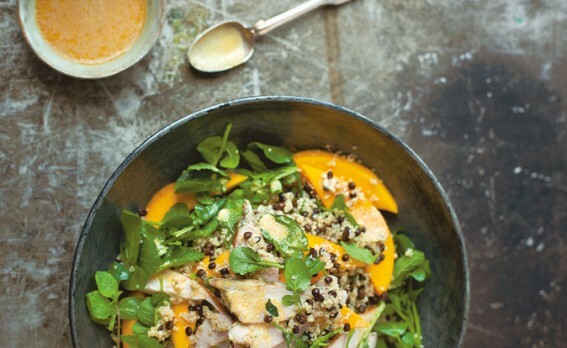 Drizzle on the creamy korma dressing just before serving.